All Muslims in the world will celebrate Ramadhan in less that 4 days from now. I have listed my Ramadhan Goals and Ramadhan Project with my children. Well, I still got another chance to do something good although this year we will celebrate Ramadhan in the country with majority of the community is non-muslim. Here, I introduced our DIY Ramadhan Cookies. One of our Project Ramadhan with my children. This is not an ordinary cookies since we include the Ramadhan notes inside the gift bag as well . A simple notes on what Ramadhan is all about. It purposely meant for non-muslim in our neighbor hood area. So, I decided to give the cookies to my daughter's teachers in her school since this project is for her and 90% of her teachers is non-muslim. 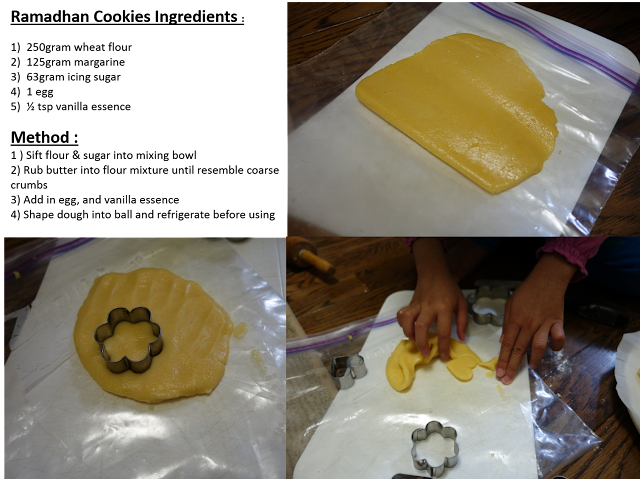 She got involved from making a decision on a shape of cookie cutter until making sure all her cookies safely delivered to the recipients. Simple cookies but yet the taste quite good for us. Crunchy and not too sweet. If you want chocolate flavor , just add in 1 TBSP of cocoa powder or vico. Please adjust the sweetness level accordingly. While waiting for the cookies to set, let's get done on the 'Ramadan notes'. I found this in Halal Kitchen Blog. The owner of the blog was very generous and kind. She shared this in pdf format and I just downloaded to my laptop. We had an issue when we want to print it out. After few times of troubleshooting, I gave up and decided to re-write with different type of font. I hope this small charity can be part of our da'wah while we still have a time in here. It's a bit shame when I have been approached by other religions.Too bad, time was not permit for me to hear and listen what they're going to say. I wish , one day I had an opportunity to do so. Perhaps, I can also share my religions to them. Ahlan wa sahlan ya Ramadhan. May ALLAH SWT shower us with HIS Blessings . May ALLAH SWT allow us to live till next Ramadhan, and make it the best Ramadhan ever. Biasa2 jer Umi... I was inspired by other muslimah too from this cyber space. Tinggal buat bende yg sama and apply. :) . Selamat menyambut Ramadhan Umi!. May it become a productive one! Miss u dear!